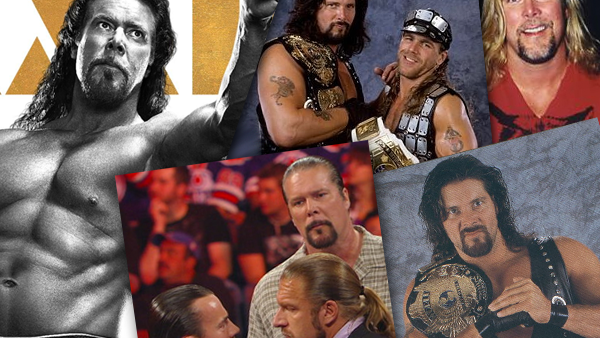 Kevin Nash will turn 60 next year, but it was 59th birthday that encouraged WWE.com staffers to delve deep into their expansive archive, posting gems and rarities of the various gimmicks he'd earnestly portrayed in a career plagued with peaks as high as the valleys were low. He was the man who survived some of the industry's worst ideas to become one of its most important innovators. He was a man who in one night inspired the longest-tenured promoter in the history of the industry to promote him as the next Hulk Hogan, just two years before he saved the original vintage from obscurity. He was also the lowest-drawing champion of the modern era and considered "cancer" by many that worked with him across multiple promotions. This list is not a gag making light of the multitude of times Nash may have been considered two-faced, but a tribute to a life well led in an industry that is notorious for its unrewarding nature. He's had a million gimmicks - so few of them good - but has made millions more from the ones that worked. It's a durability that requires more respect than a token Hall of Fame induction and the odd passing mention on Network specials. He got in, got rich, and got out, stopping just short of crushing talent as he departed. He never lost sight of what mattered most, and for better and worse, these were the ways he totted up so much money, and so many miles.